I guess you are considering the 4 states continuosly without regard of the two distinct sides. In such instance even the third state that I totally discard from my options may get some long winning sequences. The pros betting 2/3s are that a breaking single produces just one unit loss. The cons of using this approach are that the variance impact is much higher than by using two distinct sides. Hi AS i use each side by it self so maybe i was not clear at that point. And i also think variance or amount of attempts increase to catch to many different bias state with to many options. Note that 3 stands for series of three or higher. I am proud over my self to distinct this common bias with baccarat shoes and making this observations, much better then NOR that i read about at BTC. How do you play the fourth state where all 3 patterns come out? Same methodology using the other states where you win or break even with W or LW. The difficult part is what you do between states using decision making, for example you can use two bets to catch two common states and eliminate two other states. But i don't like it and need to reduce the attempts to catch the swings between states. The bias it self is doing just fine with two attempts that win or break even, the issue i have is decision making between states. Some keep track of the occurrences of 1's, 2's and 3's and hope that the sleeper continues to sleep. For example, if the count is 12,4,8, bet 1's and 3's and avoid 2's. Everything is a guessing game. I solve the puzzle, now I can play positive progressions or just flat betting my way to heaven. Congratulations. The graphs look very smooth and going up. Every serious system player is interested in an objective method, giving him information whether his system has a certain value and is going to produce a net profit in the long run. Beside the "Statistical Ecart" and other test options, with which we will deal in one of the next issues of Basics, "the Van Keelen Test" is a simple measuring procedure, with which the player can determine the chances of success or failure of his system. The Van Keelen Test, which was developed decades ago, will give the player information about the value of a system, and requires the player to check his system over a certain number of placed bets before he begins the practical play. This again has the advantage that possible losses only develop on paper and not in reality at the table! 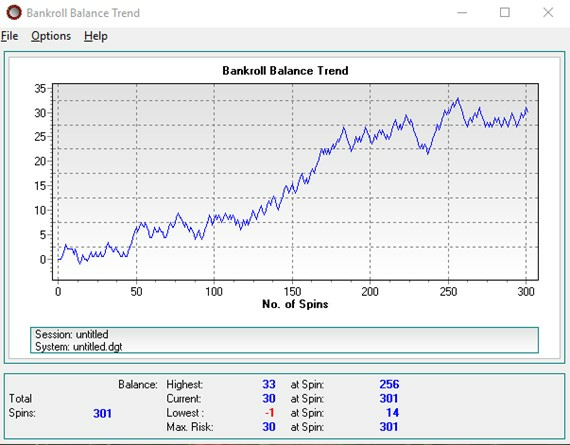 The Van Keelen Test sets into relationship the net gain of a system to the number of placed bets, whereby the minimum number of the placed bets checked for all chances must amount to at least 1000. The units wagered must be of equal value; no progression is to be used! It is very important to point out that we speak here of placed bets, not spins! 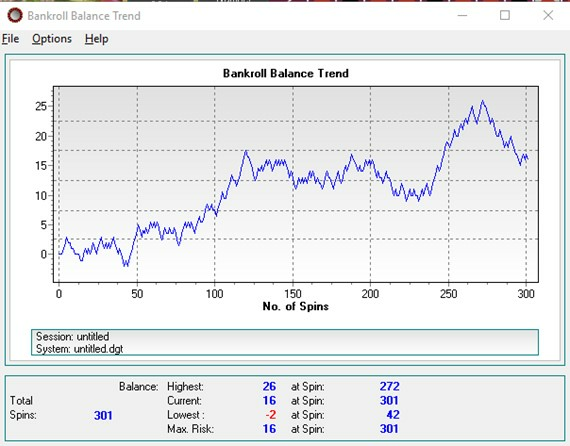 To check a system over 1000 spins, has no meaning! This testing method has the inestimable advantage that a system must be checked at least over 1000 placed bets, and on this basis a prediction about the value of the checked system is possible. With 100000 *checked bets, even a negative result can be still another feature of a good system. Because if a system indicates a real superiority over ZERO, the possibility exists, that with an adapted progression continuous gains can be obtained. 1. if after 1000 placed bets a gain of more than 100 units was obtained! 2. if after 8000 placed bets a gain of more than 60 units was obtained! So close, I peak at 70 units during 963 placed bets, flat betting, now assume I would use a smooth progression, then it would take forever to lose. Is this the same strategy but with modifications? Yes, there is with the modifications. What I wrote is the raw blueprint to show existing bias. I will give you one example but not a complete solution, there are many tiny adjustments to a hole solution. For example, take only the sequence when a series of three or higher with singles strike when you divide the random bits into sections and turning points. Then after one series most of the times will be followed by a new series within that state as they will be biased most of the times. Now if you would jump on board the first formation of three in a row that would be expensive as you would need two bets to cover both situations for the next series of two to become a higher series if the first bet loses. Yes, I say expensive because you need to reduce your bets and still have the opportunity and reason to strike available. Now assume you get a series of three and a series of two where you lose one bet, in this situation you have a new state, series to chop and is another bet to strike several times in a row. So with one singles bet or at most two bets you can cover two states and strike several times in a row where there is bias present. I take small steps in the right direction with Sputnik's March. Now two losses or less is the threshold. I will explain the following observations so you understand when and where and why to bet. This is the sections and turning points. When you see one sequence starts with two singles or more you skip that sequence as non-playable. Let me list them one by one. a) Singles and series of two is one entering point that results in two losses if it fails to become bias. b) Singles and series of three or higher is one entering point that results in two losses if it fails to become bias. c) Series of two and one single is one entering point that results in two losses if it fails to become bias. d) Series of three or higher and one single is one entering point that results in two loses if it fails to become bias. e) Series of two and a series of three or higher is one entering point that results in two loses if it fails to become bias. f) Series of three and higher and series of two is one entering point that results in two loses if it fails to become bias. When you see singles and any kind of series you follow both with two bets to cover both situations to repeat once more and avoid triplet (one of each) following the principal of 1/3.